The band in all their glam splendour -- possibly in The Ritz hotel foyer! A cursory glance at the contents page of Milesago will readily indicate to you, the reader, that we don’t intend to limit our scope to just the ‘biggest’ bands and artistes, nor just cover the ‘biggest’ events or milestones in Aussie music. Indeed, many of the most important acts that developed into seminal entities in the history of OzRock grew from humble beginnings in the smaller towns and cities outside the melting-pots of the major state capitals. And if you cast your mind over an imaginary “family tree”, you’ll discover, possibly to your surprise, that many future luminaries of Australian rock music hailed from, or at least served a form of apprenticeship in, the oft-maligned national capital! That is not to say that our subject band here, The Ritz, were by any means seminal, influential, or particularly important in the greater scheme of things, but their story is certainly worth telling here – if not simply for the tenacious originality and ingenuity they displayed, but also for the fact that such bands as The Ritz were, during their relatively short tenure, very popular in their own precincts. Here was a band profoundly influenced by the ‘prog’ movement, that pushed a few boundaries and provided audiences in Canberra and its surrounds with quality music at a time when such stuff was scarce in a live setting. The Ritz formed in early 1975, when former Heaven and Rain guitarist and musical visionary Peter Dodson teamed with talented ex-schoolmate Steve Maughan (from prominent Canberra all-rounders The Second Movement), Englishman George Bennett (who had a stint in mid-60s UK vocal outfit The Ivy League), seasoned keyboardist Alan Cook and charismatic frontman Richard Hauser (along with Dodson and Bennett, ex-Wally & the Wombats). The group presented a colourful hybrid of sounds inspired by the likes of Yes, Focus, Pink Floyd and the later music of The Beach Boys, for an audience starved of such heady and sophisticated material presented in live performance. In concert, The Ritz certainly delivered the goods. While their main rivals, Snibbo, served up a popular repertoire of R&B and hard rock standards, The Ritz put on shows of amazing polish, clarity and musical dexterity, utilising their own in-house songwriting skills of Dodson, Maughan and Hauser. They were among the first bands to introduce the wonderful sounds of the Mellotron and Moog to live Aussie music. To witness a Ritz gig (rare though they were) was a truly enervating experience. I can still remember them performing a hypnotic rendition of Floyd’s "Us And Them" and having shivers down my spine from it! The band released one jaunty single on RCA, the Steve Maughan-penned "Pick Me Up", before themselves being picked up by Mushroom Records for their sole LP, A Diamond As Big As The Ritz (the title of which was taken from the short story by F. Scott Fitzgerald), which featured a cover design by Keith D. Davis, who also designed albums for The Sensational Alex Harvey Band. 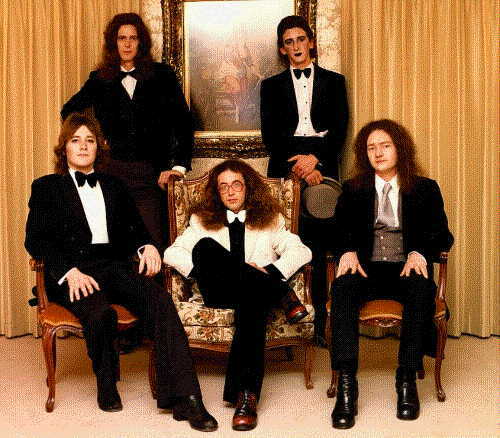 Recorded at Melbourne’s TCS Studios under the production guidance of John French, the ambitious album displayed the strengths of the group and the great songwriting skills of Dodson in particular, but, while satisfying to the listener, it unfortunately failed to really capture the dynamic essence of the band, in this writer’s opinion. The lacklustre production undermined the highly melodic, rich and inventive range of songs offered, and the album’s long gestation period before its eventual release did the band few favours. When A Diamond… emerged in early 1977 it was, alas, met with general indifference -- a situation exacerbated by a distinct laack of support from their record company. Apparently at the time, Mushroom supremo Michael Gudinski, when asked what he considered his failures, cited The Millionaires and The Ritz as such. We in Canberra didn’t mind though, because for a short time we had our own virtual Yes or Floyd in residence and we loved it! And who could resist a band that wrote songs with titles like "Piglet of the Imagination"? With the advent of punk and new wave, punters’ taste for The Ritz’s ornate, highly-orchestrated style of music -- essentially ‘prog’ -- quickly waned and signalled their death knell. Members went on to other extremely popular and successful Canberra groups, notably good-time all-purpose barnstormers Kevin McLaughlin & the Murrumbidgee Orchestra (there was no Kev; dig the joke, trainspotters!) This outfit featured Bennett on lead vocals, Maughan on bass, ubiquitous drummer Pat Italiano, former All Stars and Kevin Borich Express roadie Barry McCulloch on guitar and revered lead guitarist Ian “Willie” Winter whose impressive resume included stints with Carson, Daddy Cool, Mondo Rock and the Alberts All-Star Band. At the height of their popularity, Kev & the M.O. frequently upstaged national and visiting international acts they supported, propelled through the sound barrier by their demented sound engineer, whose identity is revealed at the foot of this profile. Their solitary (limited edition) single, "Thunder On The Mountain", backed with a version of Wreckless Eric’s "Whole Wide World" is well worth seeking out. Good times indeed. The Ritz however will remain affectionately remembered as an informed, accomplished and musically literate band that could have blown anyone else off the stage at that time. They were very very good! Recorded at TCS Studios, Melbourne over a series of sessions; October ’75 – October ’76. Engineered by John French. Produced by The Ritz and John French. Thanks to Pete Dodson, Steve Maughan and Barry McCulloch for their co-operation in the gathering of info.